In the last few years, I’ve been choosing different Frank Lloyd Wright-designed buildings and creating a variety of illustrations using my high-contrast illustrative style. I’ve done several from the breadth of his incredible 70-year career—some buildings I’ve illustrated multiple times because I like them so much. In honor of Frank Lloyd Wright’s sesquicentennial birth year, I thought it would be fun to share some illustrations I’ve made of my Top 10 favorite Wright buildings and tell you a little bit of the story behind each one. As an added touch, I’ve used selections from Frank Lloyd Wright’s 1955 Taliesin Line of Martin-Senour Paints for the color palette of each illustration. Over the years, I’ve made about a half dozen visits to Lakeland’s Florida Southern College campus, home to the largest single-site collection of Frank Lloyd wright-designed structures in the world. One building always stood out to me on every visit—the campus’ architectural and spiritual heart, Annie Pfeiffer Chapel (1941). The Chapel looks better than it has in decades, thanks to a recently completed restoration. I especially like the dramatic angles of its bell tower and thought it would make for an interestingly cropped illustration. This River Forest, Illinois residence, originally built in 1908, is remarkable for several reasons. Not only was it designed for one of Wright’s Oak Park Studio associates, Isabel Roberts, but it also happens to be one of the only buildings that Wright designed during his Prairie era and then came back to re-model in 1958 during his Usonian era. Sadly, the home’s most famous feature, the giant elm tree that Wright built the house around, died and was removed in 2015. I created this illustration with the tree still present growing up through the roof as a reminder of how much I loved this union of architecture and nature. Near the Isabel Roberts House in Oak Park, Illinois is another one of my all-time favorite Wright houses, the Oak Park Home and Studio. Although not as impressive as many of his other Oak Park residences, I’ve always had a soft spot for Wright’s 1889 Shingle style home. There’s something about seeing the early design experiments and how he worked out several of the architectural ideas that would later be incorporated into some of his most famous buildings. The home is connected to his 1898 Studio addition that is a wonder of creative ingenuity itself, so visiting this wonderful Wright for Wright home is a richly enjoyable experience. Visiting the S.C. Johnson corporate headquarters (1936) in Racine, Wisconsin is on every Wright-aficionado’s list. I’ll never forget the first time I stepped into the “Great Workroom” and had my breath taken away by the forest of concrete “lily pads” that made up this wondrous space. I finally had one of my long-time wishes come true when the S.C. Johnson Company recently opened the Research Tower (1950) for tours and I was able to see inside a Wright building that had been inaccessible for decades. If only all of us could work inside office spaces like the ones Wright designed for Johnson Wax! My list of favorite Wright buildings contains one that has unfortunately been lost, the 1904 Larkin Administration Building. The brick monolith that once stood in Buffalo, New York was another one of Frank Lloyd Wright’s corporate masterworks. With is massive multi-story inner atrium of light; it provided a harmonious and ingenuity-filled workspace for the turn-of-the-last century soap company. Sadly, after years of decline, the building was demolished in 1950 and a true architectural masterpiece was lost. This building reminds me of what has been lost and what could be lost if we don’t appreciate and preserve Wright’s legacy. Wright’s desert home and studio in Scottsdale, Arizona (1938) is a truly magical place. The angular buildings of stone masonry seemingly grow from the valley floor and echo the angles of the mountains that surround the camp. 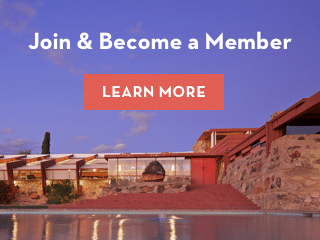 Like many of his other personal homes, Taliesin West is a laboratory of ideas and innovations that would later make their way into many of his other architectural works. I’ve always especially liked the large boulders covered in ancient petroglyphs that Wright integrated into the layout of Taliesin West almost like mystical totems of the past. I decided to create this illustration with one of these stones prominently featured. There are not enough superlatives in the English language to describe Fallingwater. The undisputed residential masterpiece of Wright’s entire career, the 1936 “house over the waterfall” built for Pittsburgh, Pennsylvania, retail giant, E.J. Kaufmann, is the most famous house in America, if not the world. I tried to capture the three-dimensional drama of this cantilevered architectural icon with only flat shapes of color. It’s a subject I find myself illustrating over and over, again. The spiraling majesty of the Solomon R. Guggenheim Museum (1959) is a sight to behold among the mundane high-rise buildings on New York’s Fifth Avenue. I remember the feeling of total awe staring up at the great web-like oculus window in the museum’s atrium. The design is like no other building you’ll likely ever experience and one that left an indelible impression on me. It’s an almost spiritual experience to visit this last great architectural wonder by Frank Lloyd Wright. Frank Lloyd Wright’s 1911 home and studio, built hugging the brow of a hill in the Wisconsin valley of his Lloyd-Jones ancestors, is one of my favorite places on Earth. The various Wright-designed buildings on the estate cover a range of years and have served as farm, school, home, theater, and architectural studio. Each one is unique and exudes a sense of mystery and timeless beauty from its stone and wood walls. Treasures from the Far East can be found standing silent watch around the estate. I chose to illustrate one of these seated statues with Taliesin’s Hill Tower behind it. It’s an almost impossible task to choose an absolute favorite Frank Lloyd Wright building. He created so many unique and wonderful buildings that all have something to enjoy. However, Wright’s Unity Temple (1906) in Oak Park, Illinois, holds a very special place in my heart. The imposing geometric concrete exterior gives way to a pathway of discovery upon entering, until you are released into the colorful and natural light-filled sanctuary. It’s one of the most uplifting spaces in world architecture and one that means a great deal to me: I married my lovely wife there. The building has been undergoing a much-needed restoration and is set to open again to the public later in 2017. I can’t wait to see all the work that has been done to bring Unity Temple back to its intended glory and enjoy its beautiful spaces once again. All photos courtesy of Eric M. O’Malley. O’Malley is a graphic designer and illustrator living in the Chicagoland area. Trips to nearby Oak Park, IL fostered an enduring passion for Frank Lloyd Wright’s architecture and helped spark the creation of PrairieMod, Wright Society, and the Organic Architecture + Design Archives. Eric’s design and illustration work has appeared in The Friends of Kebyar Journal, The Journal of Organic Architecture + Design, The Saturday Evening Post, and The Frank Lloyd Wright Quarterly.